Prompted by a post on Down To Earth Mother we decided to sign up for Supermarket Free month in April (yeah, I know, I should have let you know earlier…). We agreed to steer clear of all supermarkets for the whole month. We almost made it! In the end we made one emergency trip to Aldi the night before Little Fearse’s birthday for cake supplies, other than that we managed to go for the whole month without stepping foot into a supermarket. Let me give you a brief overview in an annoying question myself, answer myself conversation. The cake that made us break our pledge. Worth it! Was it hard? Yeah. It was hard. Will we stick to it? Some of it. How long did it take us to go back to Aldi? One day. Just one. Was it worth it? Yes, it was definitely and totally and absolutely worth it. It has entirely changed our outlook on food and our community and our resources. Not to mention helping us realise how little we actually need. Mostly we wanted to try and do this without changing the types of foods we like to eat. We have limited our use of Woolies / Coles (more about why here) over the past year to, mostly, the eco-nappies we buy for day care and outings and the disposable wipes we use for the same purpose. Unfortunately no other local stores stock the brand we like. This was our first challenge. I solved it by purchasing our nappies in bulk online from a small business. They were delivered next day. The nappies were cheaper than in the supermarket and the delivery costs were reasonable, even though I ordered two large boxes ($8.95). These should last us about 3 – 4 months. Until recently we have also been able to buy our preferred brand of natural dishwasher detergent from the same site. It has now been discontinued so we’re trialling some health food store varieties. We were not able to get the same brand of wipes but found something similar, though more expensive by about $3, in the local health food store. 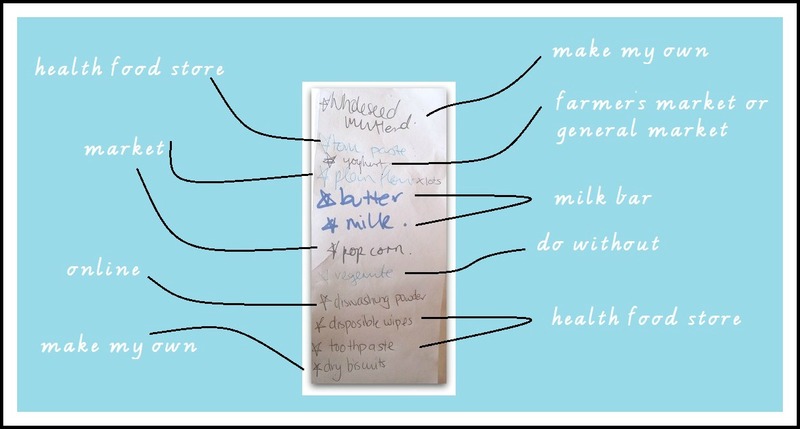 We actively sought out alternative places to purchase the things we use a lot – flour, beans, pasta, tinned tomatoes, butter, milk. The health food store had a lot of these things but was quite expensive. I don’t mind supporting the store – it is a small business that has been around for a long time – but we can’t sustain buying these things there permanently. Since April ended I have taken to buying organic tomato paste (it is in a glass jar which I love for our zero waste challenge), organic tinned beans, Moo Goo products, tooth paste and our disposable wipes (we only buy one pack a month) from the health food store. I like the fact that you can develop a relationship with the people who work there. I had a great conversation with one of the women when I went in to buy hot cross bun supplies that made the difficulty I had parking, the fact that I had to go out of my way and also the extra $$ spent worth it! I’ve also made a few trips to the Dandenong Market for flour, dried beans, pasta, pop corn, fish, bulk yoghurt (think soda bread for bulk baking quantities!) and spices. This is something I plan to continue doing when I can. It was easy and fun and pretty close to home. Little Fearse has become very interested in trains, so we might even catch the train there once in awhile. We visited our local farmer’s market to see what we could purchase there. Most of the things available we are able to purchase at our regular Sunday market, but we were stoked to find a local guy who makes yoghurt. Unfortunately the yoghurt we bought (which was quite expensive at $8 a kilogram) went bad well before the use by date. I’m willing to give him another shot, but if it happens again we’ll be sticking to the Aldi organic yoghurt which is well priced and Little Fearse loves. Unless we need it in bulk for something, in which case I’ll buy it at Dandy market where it is $6 for 2 kilos. Yeah, seriously. At a second farmer’s market in another near by town we found a local guy who makes apple cider vinegar. Stoked! We opted to buy our toilet paper from Who Gives a Crap. This was recommended by DTEM and friends and was also sponsored by the Supermarket Free Month. We will continue to do this because the quality is good, the price comparable (somewhat) and postage fast and free (next day). We have room to store bulk toilet paper and I love that buying the paper helps others in third world countries have access to something we consider a basic need – safe, sanitary toilets. We discovered our local green grocer stocks bulk spices, flat breads, milk, a variety of condiments, frozen berries and a large array of different types of flour. A handy little store which we have only previously been to for the occasional fresh food item during the week. There were some things, like Vegemite, that we just had to do without for the month. I imagine this is something we’d be able to find online if we searched for it hard enough. We started buying our bread at the local bakery earlier this year. It was one of those things that made us feel like fools to have done it any other way. The bread you buy in a supermarket is basically not bread in comparison. This, of course, will continue. Those of you that are following along will know that we buy all fresh fruit and vegetables, plus cheese and nuts from the Sunday market. For two glorious months we were also able to buy our meat there, but the butcher has since bought a food van and left us meatless. When we need to buy fruit or veggies on a different day of the week, for whatever reason, we will go to the local green grocer. Occasionally I accidentally lose my senses and buy some fresh fruit from Aldi. This is something I have no intention of continuing (but we’re all human…). We now buy our meat, mostly, from the local butcher who can tell us where everything is from and what it was fed when it was alive. He also makes a wide array of his own sausages, much to Little Fearse’s delight (pineapple, cheese and chicken? Ugh.). We buy organic butter and milk at Aldi, along with their wholemeal pasta, passata, frozen peas, water crackers, Vegemite, sanitary products, sometimes chocolate, sometimes ice cream. The reason we chose Aldi is because we don’t want to support what Coles and Woolworths does to local suppliers (pulls the price down, down, down…until it is entirely unsustainable). We have reservations about Aldi, most of which are echoed in this post, so why not go there and read that? 😉 (Was that super lazy of me? Yeah.) We also shop at our local IGA sometimes. We go to the supermarket about once a month, sometimes dropping by quickly for milk or butter outside of those shops. Going super market free wasn’t a huge leap for us. By making gradual changes we’ve really made this a lifestyle we can sustain and adapt to our foodie desires. As a side note, this was a great opportunity to try making our own stuff, from mustard (marginal success) to biscuits to cereal. There is a lot we can make here at home that is good quality and tastes pretty good. The best about that, of course, is knowing what goes into it. I was surprised at how easy it was to find recipes for things that I wouldn’t normally even consider making myself. Have you ever tried going super market free? What do you think the biggest challenge would be for your family if you never used a super market again? PS Reading back, I kind of feel as though someone had challenged me to get as many DTEM mentions as I could into this post. This is not so, but if you haven’t read Jo’s blog, I highly recommend it (clearly). It is well informed, well researched and well balanced. Tagged Down to Earth Mother, farmer's market, food, market, supermarket, Who Gives a Crap? Today I bought something new. I had been eyeing off this beautiful colourful teething jewellery for a few weeks at the market. It is designed to look great on but also provide your child with relief when teething. Little Fearse loves chewing on my necklaces, teething or not. The business is run by a local Mum. She sells her product through Facebook and the market. It ticks a lot of ethical buying boxes, except the fact that a) it’s not a necessity and b) it’s new. Little Fearse isn’t even teething at the moment. (I’m still a little traumatised from her last bout of teething, to be honest, which left us all sleepless – and helpless – for over a week.) I bought a teething bracelet without even really thinking about it. It was a strange anomaly in my personality – some kind of minor blip in the system. I have spent the rest of the day feeling guilty. This is also on top of (full disclosure) the breaking of my no “new” clothes rule – I purchased a pair of jeans at the op shop on Saturday (half price purple tag got them down to $3.65) and a shirt at the market today ($1). I have kind of evened that out by donating a pair of jeans and shirt from my wardrobe. I still feel a little alarmed at how easily I slipped back into old habits. Purchasing something new didn’t feel good and it didn’t give me any buzz. Finding the vintage shirt at the market for $1 gave me a buzz…but it still didn’t feel good afterwards. I’m a little disappointed in myself, to be honest. These are minor purchases that really don’t mean much in the scheme of things – except that I feel I’ve let down our project a little. On the upside (because it’s always good to end on an upside) we discovered the joys of frozen watermelon today thanks to a comment on our last post from Verity. If you love our blog, I reckon you will enjoy Verity’s blog The Happy Rebel. She is also working on reducing her consumption, but in a much more challenging environment. Read! She’s very inspiring. I hope those of you in Victoria are surviving the heat okay. The day before market day. The 2-4-1 challenge might be our best strategy for BNN so far. Since setting the challenge that each new-to-us item into the house means two items out I have noticed a marked change in my thinking. On Sunday I went to a market that sold second hand items for children and babies. I was hoping I might find bed rails or shoes for Little Fearse, or maybe even a Little Squirt (I have bid on Ebay on FIVE of these now and been outbid at the last minute for each one!). I was keenly aware that there was going to be a lot of stuff there that looked appealing, or was cute, or would be very useful to us. I took a limited amount of cash and a list of five things I could look for. Anything else I was to walk right passed. 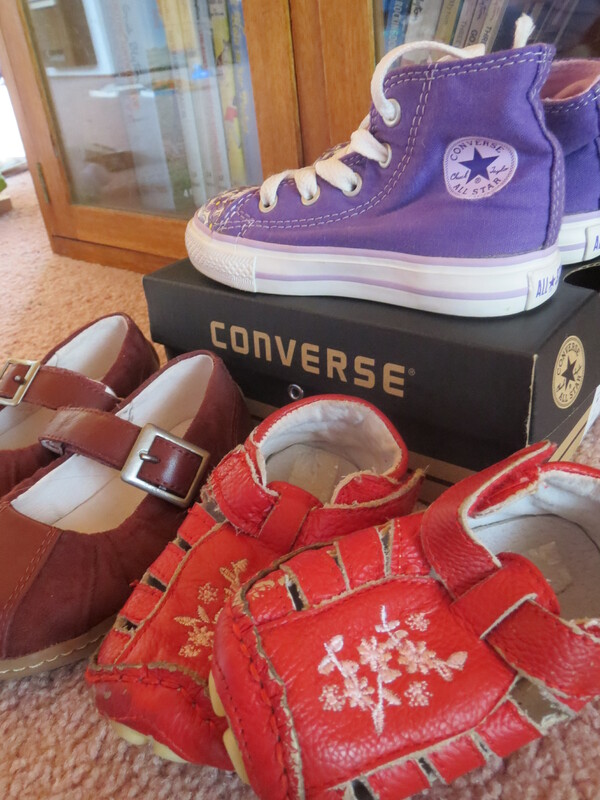 I found three pairs of shoes for Little Fearse there, the cheapest being $1 and the most expensive $10. How could I go passed a pair of purple Converse hardly worn? (I know, I know.) I feel like we are now covered for Little Fearse’s first pair of shoes. She is walking now, not at the stage yet where she’ll need them, but soon. Each of these pairs of shoes is a different size. I then found two sleep suits in size 2 – not technically on my list. I have been bidding on some of these on Ebay lately, also, and found that they tend to go for upwards of $30. I got these for $5 and $3, so I don’t feel bad about that at all. Anyway, I passed by lots and lots and lots of other things that we could use now or in the near future. All I could think about was the 10 things I was going to have to get rid of when I got home. I felt really pleased with what I brought home. Things we will definitely use. I didn’t have any buyers regret and I was able to find ten old uni readers and teaching resource folders that I don’t use to get rid of. Plus, it’s put a dent in the mess of old study things left over in Little Fearse’s wardrobe. I think that this challenge will really help with the hoarding issue, too. Soon I am going to update the clutter collage I uploaded here. Things are looking so much better already. I really love doing the fruit and vegetable shopping at the market on a Sunday. I’m not 100% sure if it’s cheaper, but I do know the food lasts longer. It isn’t all grown locally, though we do go to a few different stalls to pick up local stuff when possible. They are small businesses, though, and that makes me happier than buying from the big two. Australia’s supermarket duopoly troubles me greatly. Avoiding these two chain stores is one of our ‘side’ projects this year. So far the results have been dubious, but we have not bought fruit and vege from the supermarkets for at least the last 8 months. Inspired by the No Impact Man (I should probably try and remember his actual name if I’m going to mention him so often) we thought about how we can reduce our waste at the market. We already take reusable bags, but we do collect things like seconds fruit and eggs which come in packaging. Today we decided we were going to work on reducing the packaging. We bought 2 kilos of apricots and 2 kilos of nectarines (both seconds, which makes me really happy) and had them taken out of their boxes and poured into our reusable bags. I figure it’s better for the vendor (they get to keep and re-use their containers) and also for us, as it reduces our recycling. The seller was bemused but didn’t quite understand why we didn’t want the boxes. We then returned our egg carton to the egg seller. He was actually quite stoked. He gave us the eggs for $1 less. I’m pretty sure he did that last week, too, so I’m not going to claim some kind of karma here. We also have the option of buying $1 bags of random fruit and vege from the stall we buy the bulk of our stuff from. We almost always grab a bag of really ripe pears (usually 2 – 3kg) because pears are one of Little Fearse’s favourite snacks. This week we got a huge bag of bananas, a bulk lot of onions and a punnet of strawberries (most of which are fine). 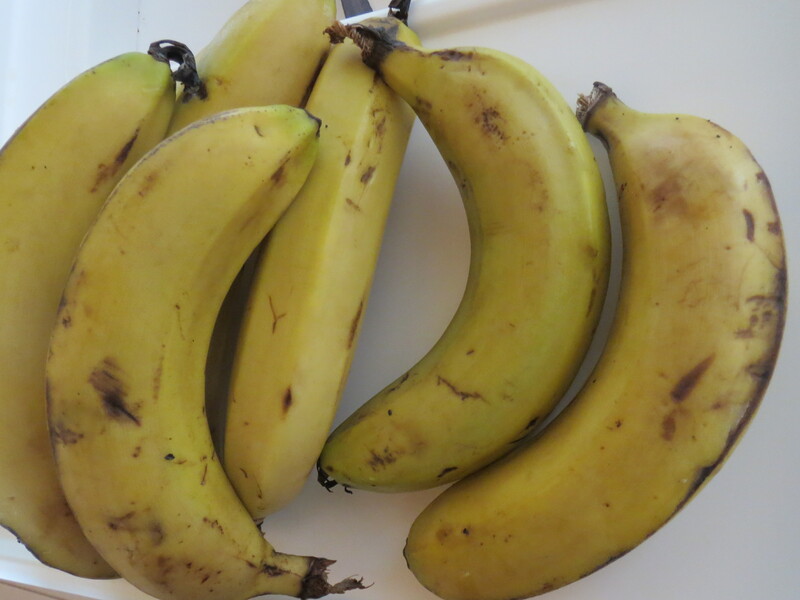 The bananas are still firm, the skins are just damaged. 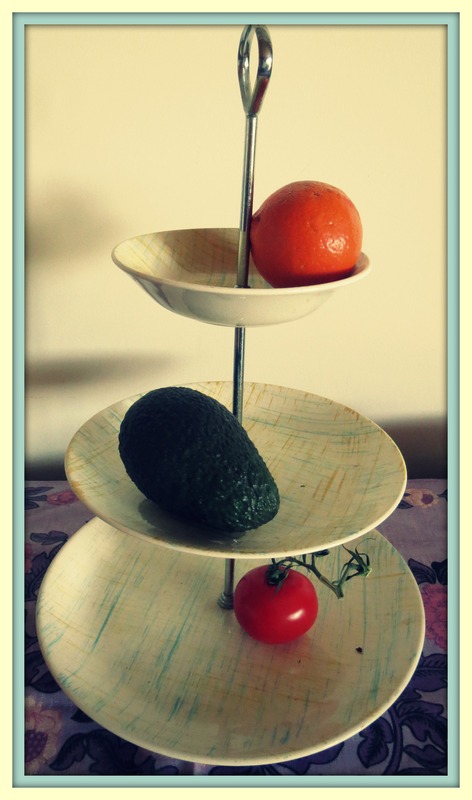 I guess we’re benefiting from the fact that people care about what their fruit and vege looks like. It seems insane to me, but I did grow up on a property with a large orchard. We’d eat fruit with scars, fruit that grew in strange shapes, fruit with holes in it from the birds… If it vaguely resembled fruit, we ate it. Really, to become a sustainable society, we have to stop caring about that kind of thing. I mean, this is the smallest of first steps that we can take. Fresh food is so valuable. When did we become a society that would happily eat a McDonald’s thick shake (who knows what they put in that?!) but not a slightly brown banana? Anyway, I’m looking forward to using some of the “on special” vege I bought to make my own vegetable stock. I use so much of it, and it seems silly to keep buying it from the supermarket. Yay for cheap onions. Well, we didn’t buy a fat pig. Maybe next time.